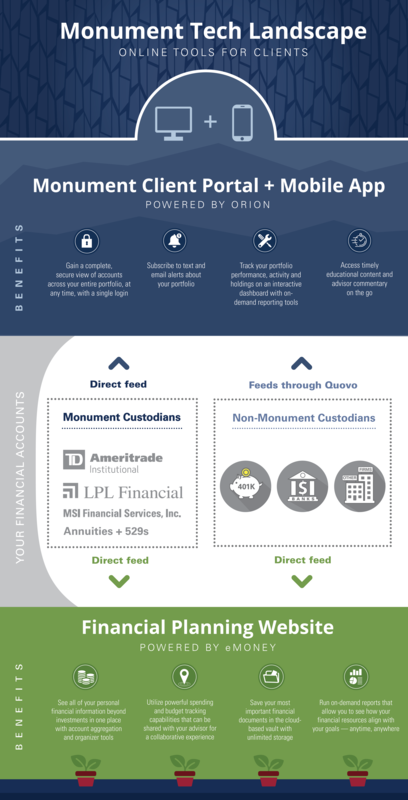 Client Account Login | Monument Wealth Management | Washington D.C. These are online platforms that we provide for our Private Wealth Management Clients. Please click the links below to log in and view your accounts. This Portal is your main hub for running viewing interactive reports on all of your account data and performance. The data in this portal is updated once per day, so it will show numbers as of the last market close. Please see our FAQ page or email our Team with any questions. Log into TD Ameritrade Institutional's AdvisorClient.com online system to view your TD account values in real time. Log into your Private Wealth Planning Website powered by eMoney to view financial planning and budgeting information on all of your aggregated accounts. This data is updated multiple times throughout the day, but is not in real time. Log into LPL Financial's Account View online system to view your LPL account values in real time. Wondering how the Monument Client Portal fits in with the other technology you use at Monument, and how it benefits you? Check out this infographic.